Welcome to Marvel Strike Force Heroes page. This is the full description of MSF Gamora stats, skills and abilities. Gamora is a Guardian Brawler capable of delivering an enormous amount of damage. Her first skill inflicts heavy damage to the target and has a 40% chance for one or two bonus attacks. Her second skill does not hit that hard but always Chain to up to 2 adjacent targets and fills her Speed Bar by 100% on the kill. Gamora ultimate assassinate target for only 370% of her base damage (that is small damage compared to other heroes assassination skills) but it is always done under the effect of Offense Up and also fills her Speed Bar for 100% on the kill. Gamora passive ability provides her and her allies an additional critical chance. It may seem that there are better damage dealers in the game but Gamora speed and critical chance along with her ability to play multiple time after kills make her the deadliest brawler in the game currently. Gamora is expensive and her price is 100 shards but because she can be farmed in blitz supplies and blitz orbs she can be obtained with no problems after 20 days of playing (at most). Gamora shards are also obtainable in Mega Orbs and Premium Orbs. Attack the primary target for 80% damage. Chain up to 2 adjacent targets for 60% damage. On Kill, fill Speed Bar by 100%. 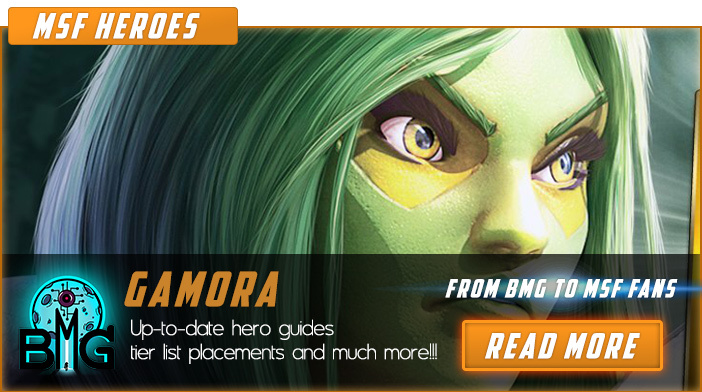 We hope that you enjoyed the description of MSF Hero Gamora. For detailed information about other MSF Characters check our MSF Heroes page.